This article will explain how to set up an nbn™ Fibre Phone service. Unlike Netphone (VoIP), Enhanced Fibre Phone (VoIP) is a type of phone that was only available with nbn™ Fibre to the Premises (FTTP) broadband connections. This product is no longer available for residential customers as of 23 August 2017. If you have nbn™ FTTB, FTTN, Cable, Wireless or Satellite, it is impossible for you to have a Fibre Phone service. It’s likely that you have a Netphone (VoIP) service instead. If your home has internal network wiring (smart wiring), you’ll need an additional RJ11 phone cable if you’re not plugging your handset directly into the nbn™ Connection Box. Once your nbn™ Fibre Phone service is active, all you’ll need to do is plug your handset into the UNI-V 1 port on the nbn™ Connection Box using an RJ11 phone cable. Note: Since mid-2013, nbn™ Fibre Connection Boxes have been installed with a plastic cover by default. To lift this cover and see the ports and lights, gently prise the bottom of the cover away from the two clips holding it in place at the bottom of the unit and then lift the cover upwards. See Lifting the cover for more details. Please note that smart wiring is specifically installed by an ACMA-approved electrician and should not be confused with simply having multiple phone sockets (i.e. those previously used for landline phones and ADSL broadband on the copper network) unless those sockets were re-wired by an electrician to be used for smart wiring. You can only use this method for Fibre Phone if your smart wiring includes phone cable wiring. If your smart wiring is Ethernet-only, you’ll need to conect the handset directly to the nbn™ Connection Box instead. 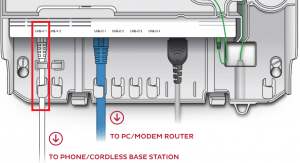 Plug one end of your RJ11 phone cable into the UNI-V 1 port on your nbn™ Connection Box, and then plug the other end into an available phone port on the nearby patch panel. Use another RJ11 phone cable to plug your phone into the corresponding phone port on another patch panel in your home. Please note that the phone cables should never be connected to a switch or router. What about my existing phone sockets? Most homes have wall sockets for fixed-line phone services that run on the old copper network. Once you have cancelled your fixed-line phone service and the copper network is decommissioned, these sockets will no longer work. It may be possible to have these sockets re-wired to serve as internal wiring for your nbn™ Fibre Phone service. Currently iiNet is unable to offer this kind of installation, so please consult an ACMA-approved electrician to arrange any rewiring in your home. Smart wiring, which may also be referred to as Hub wiring, is internal network wiring (e.g. Ethernet and/or phone wiring) that’s installed by an ACMA-approved electrician. Internal wiring links patch panels in different rooms of the house, including one patch panel near the location of your nbn™ Connection Box. 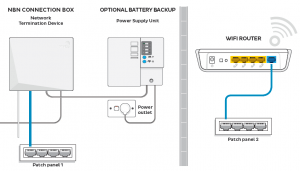 This means that equipment such as WiFi routers and Fibre Phone handsets can be plugged into a patch panel in a different room yet still be connected to the nbn™ Connection Box. These lights may help you quickly check on the status of your NBN™ connection which may be useful when troubleshooting NBN™ FTTP issues. Please note that the FTTP Connection Box should not be confused with the Connection Box for NBN™ Wireless. Contact us today – our technicians are ready to help you solve that problem. HOW TO GET YOUR DEVELOPMENTS NBN READY SMOOTHLY? What is a bridge tap? Installing modems and phone lines at the office, warehouses or shopping centres; things are more complicated than a data cabling at home. You might need a specific cabling system, connecting multiple computers, printers or phones which is not an easy task, so is better to hire an expert. 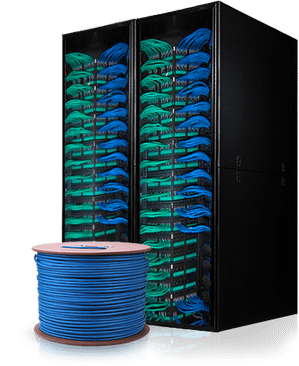 Although, you should know which are the basics of a network and data cabling system (Structured cabling) in order to know how to select the best option for you and your business. listen to Rob by clicking play above.